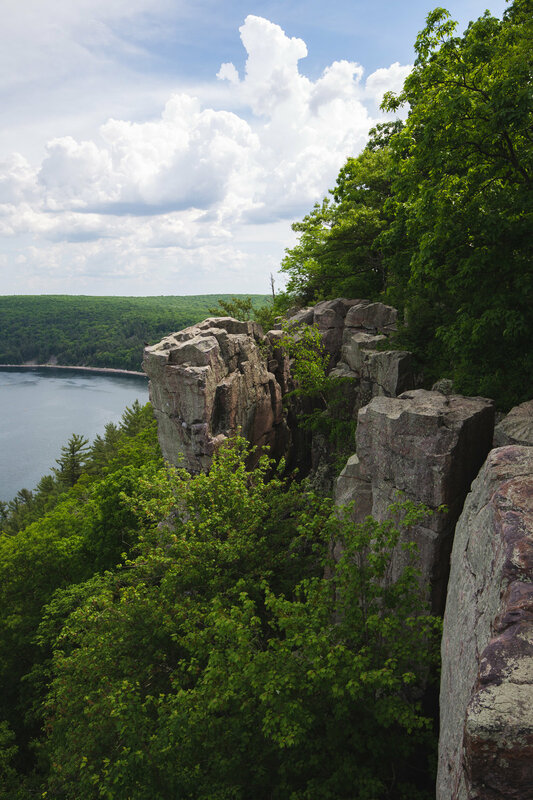 Highly considered to be the more adventurous of the two bluffs, this hike is not as easy! However it can be done by all ages (even after a joint replacement surgery!) 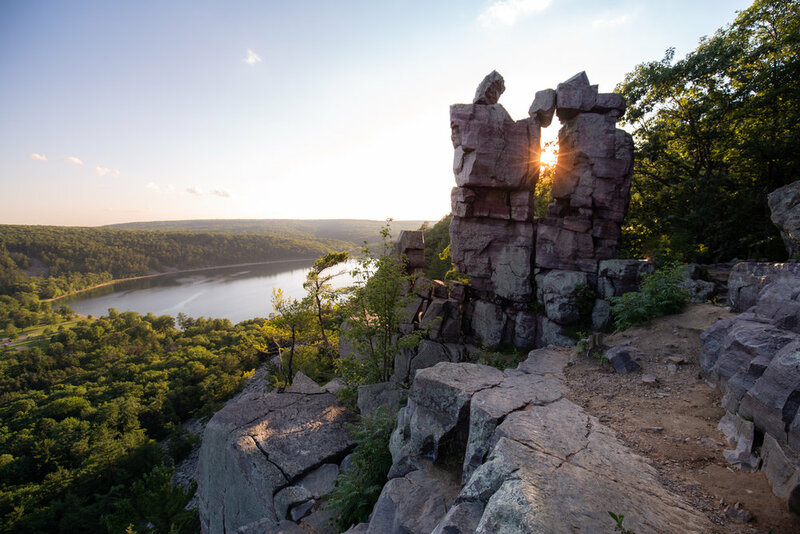 It is on this bluff where you can see the famous Devil’s Window, and Balanced Rock formations! All of these formations are on the south side of the bluff so if you want access to the more rugged side of the hike, park at the South Parking lot! If you want a gradual walk up the East Bluff, this is your hike to the top! 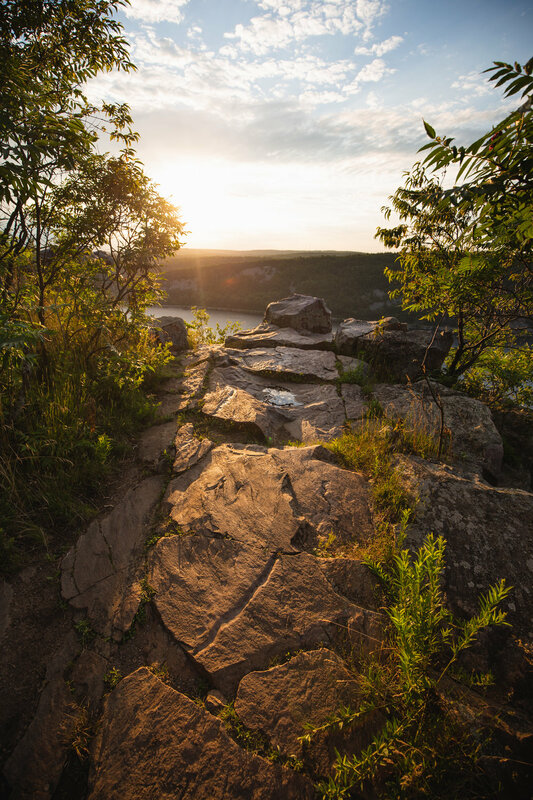 There are no views on this hike until you get to the main crossroads, but it is perfect if you want a leisurely stroll away from the cliffs on an incline through the forest. 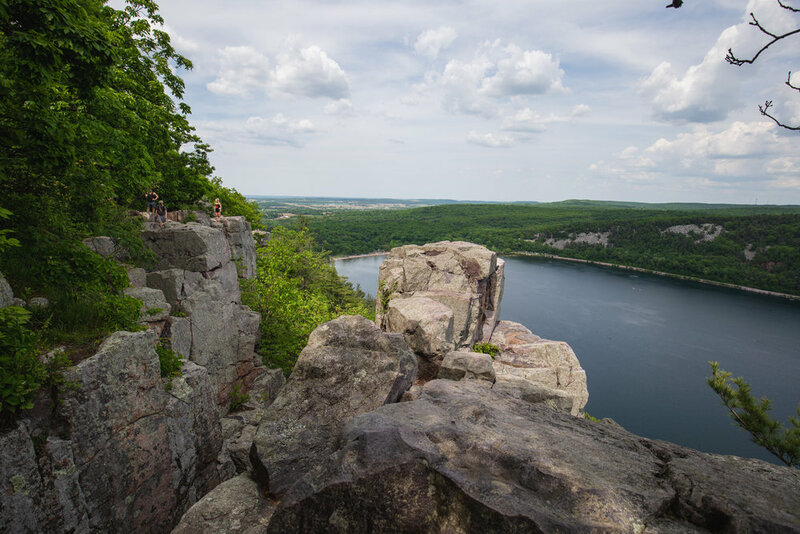 The East Bluff Trail is the main trail from the north side of the lake / visitor’s center that will take you to the famous rock formations. There are great westwardly viewpoints of the lake and immediate bluff all along this trail. There are plenty of places where you can pose for candids with your friends and enjoy a picnic lunch or a snack on the way. Eventually you will reach the Balanced Rock Intersection and you can either go down to the south parking lot, or continue on toward the Devils Doorway. This is a classic trail up to the top of the East Bluff. 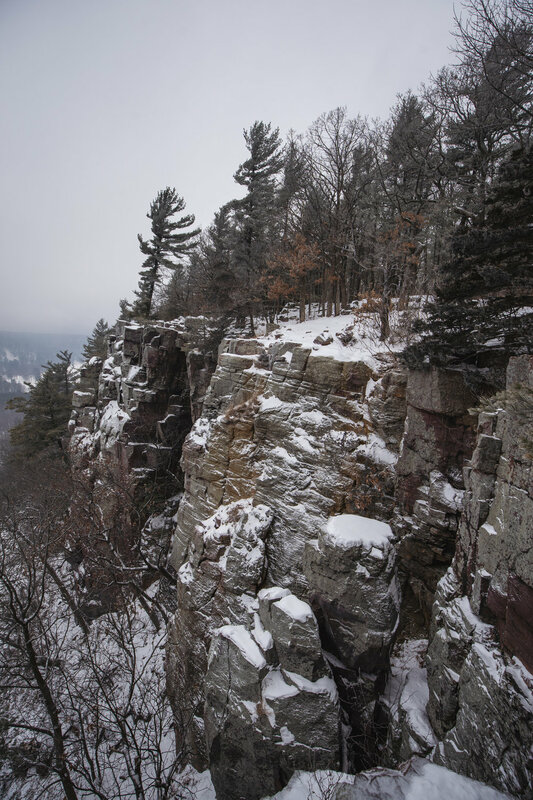 You will go approximately 0.2 miles up toward the middle of the bluff and you will loop back toward the East and find a clearing and a great viewpoint. There will not be any signs for the Balanced Rock formation, you have to find it on your own! Once you reach the level point of the trail, keep going southeast and you cannot miss the formation. There is no formal trail to get to this point, so keep your eyes open and you will be fine! 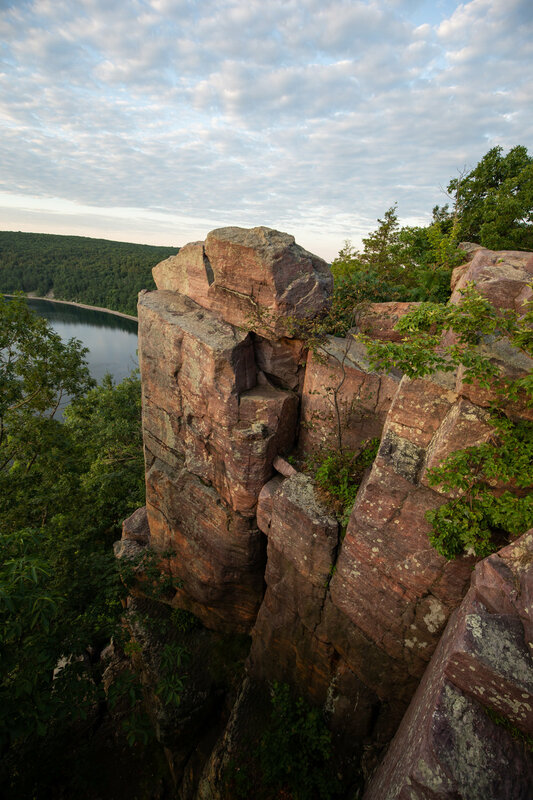 If you are here in the summer, there will be plenty of other hikers or rock climbers available to answer your questions. Keep following signs toward the top of the trail and you will be on the top in no time! Once at the time you can either take the East Bluff trail back to the north side of the lake or south toward the Devils Doorway. 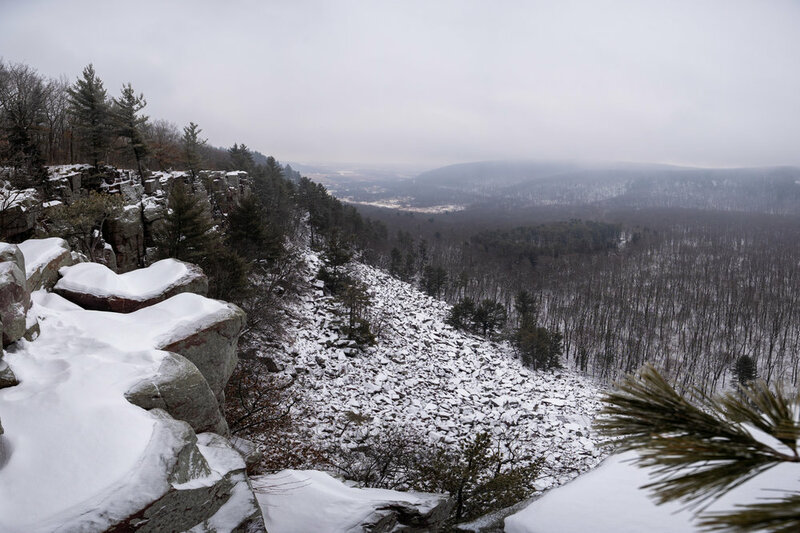 You can see from the photos if you decide to hike the Balanced Rock trail in the winter, trail visibility may be limited! There are helpful markers along the way and there is a man-made staircase on this trail as well. 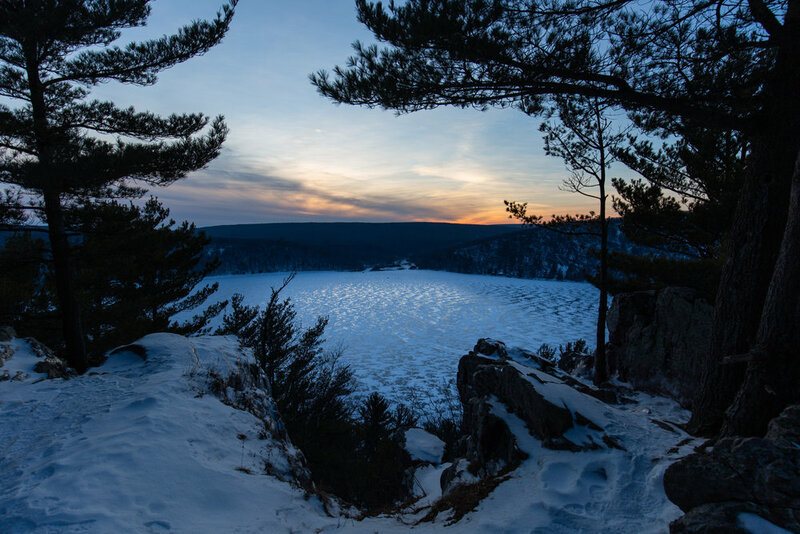 If you want to hike the most strenuous and steepest trail at the lake, this is it! 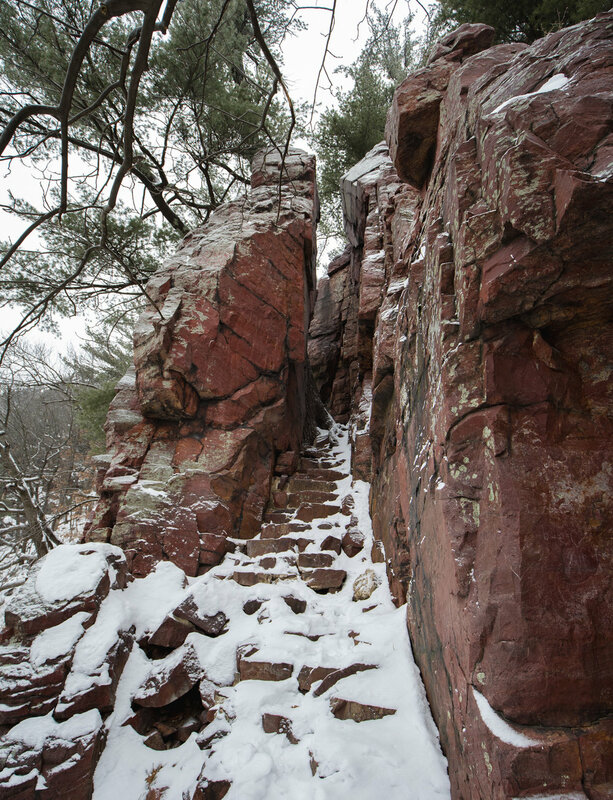 You will ascend almost straight up on a stone staircase from the ground level to the top of the bluff. This trail offers many unique rock formations along the way. 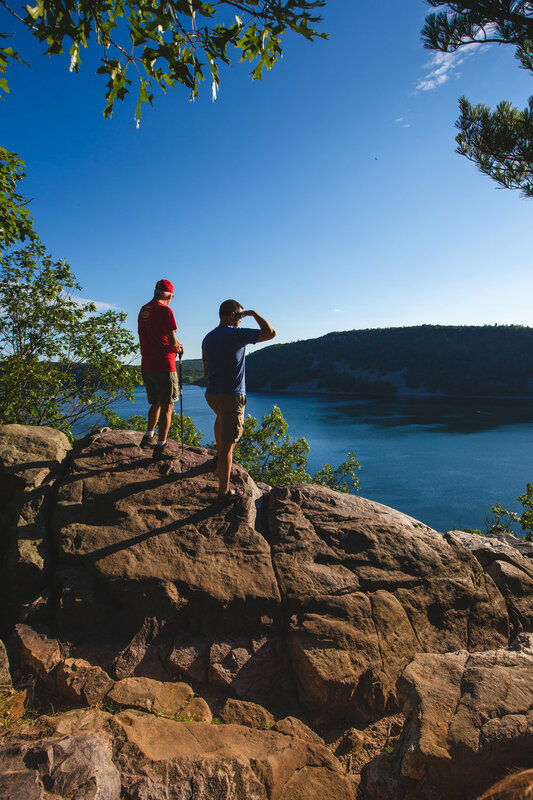 You will go up through the forest about 0.2 miles and then go through the narrows of the trail with 25 ft. cliffs on both sides of you. Once you are almost up to the top you will find the pothole formations directly to the left side of the trail where water fills up after a rainstorm. 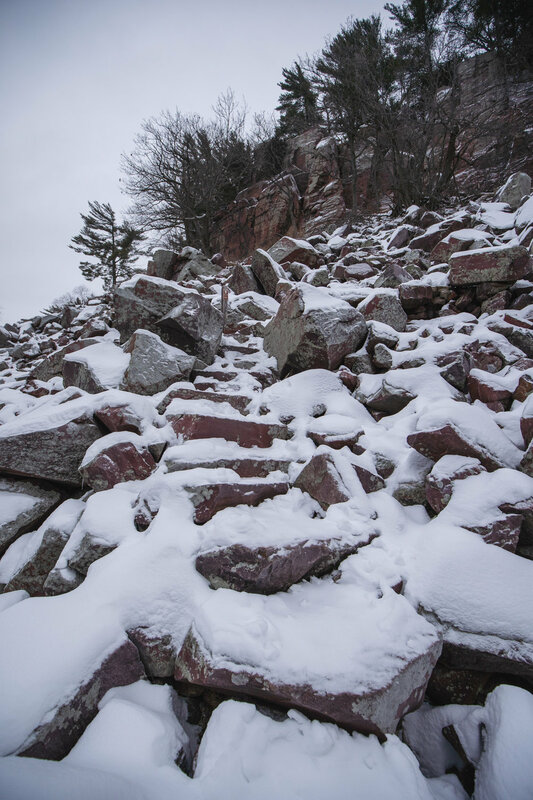 Once you are on the top you can either go toward the East Bluff or toward the Devils Doorway. 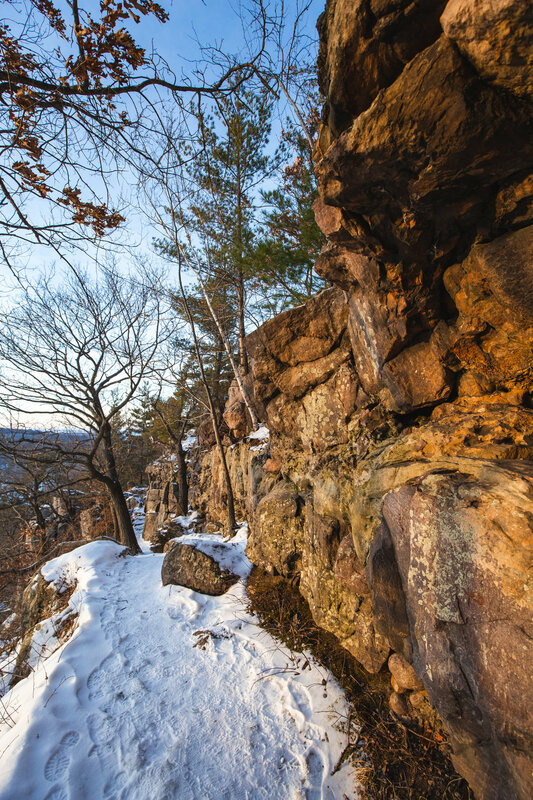 If you can avoid one trail in the winter, avoid this one. It is a slippery slope the entire way up or down. Cramp-ons are a must in winter! Once you are at the Potholes trailhead on top of the bluff, continue going East away from the Devils Doorway. This is a lesser known portion of the trail that has spectacular views of the basin below! While there is no lake, there is an array of trees that form a golden sea of yellow and orange in the fall months. This is the longest path back down to the South Parking Lot. Be aware of the many pigeons that like to gather on top of the eastern bluffs. This is widely considered the beginner bluff of the two. It has a much more gradual ascent/descent on either side, however there are not as many unique geographical features or views. This trail can be accessed by the either the north or the south side of the lake. Park at the main parking lot and walk all the way to the paved path by the lake and continue walking north until you reach the fork in the road to either the Tumbled Rocks trail to the left (around the lake) or the West Bluff trail to the right. This is typically the busiest trail in the park. 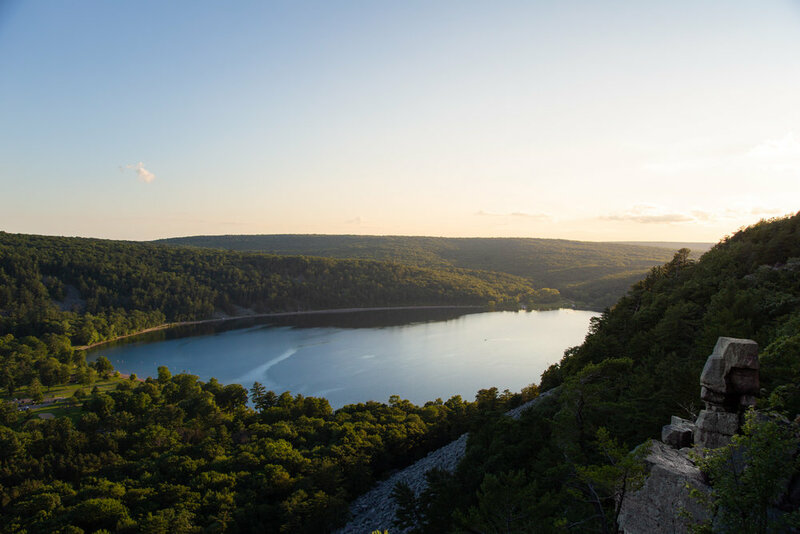 You will be waiting at some points for slower hikers to ascend the bluff! If you plan on coming to the park and wanted to walk around the lake but did not want to actually hike up the bluffs, this is your trail! 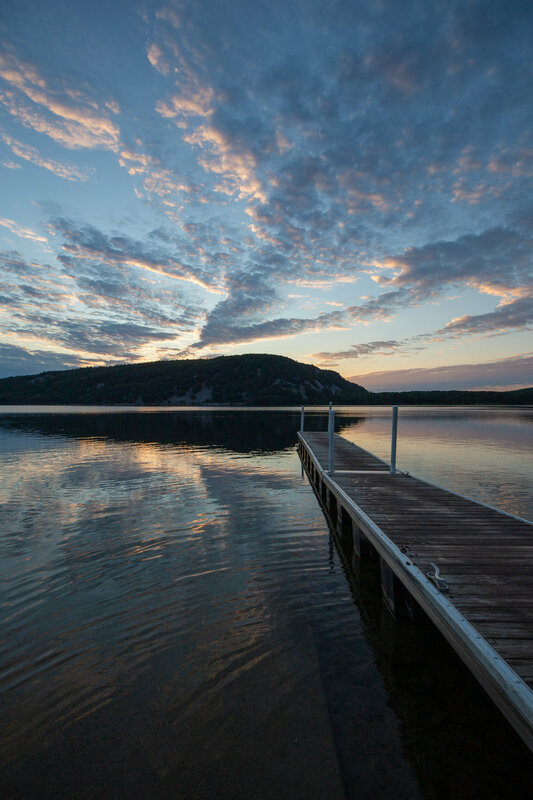 This is a 2 mile out and back or 3 mile round trip around the lake that starts on either the North or South side of the West Bluff. Be aware that even though everyone else is walking on the train tracks, there is an actual train that comes through there! Use this path with caution! Last but not least, this park is best viewed from the lake itself! 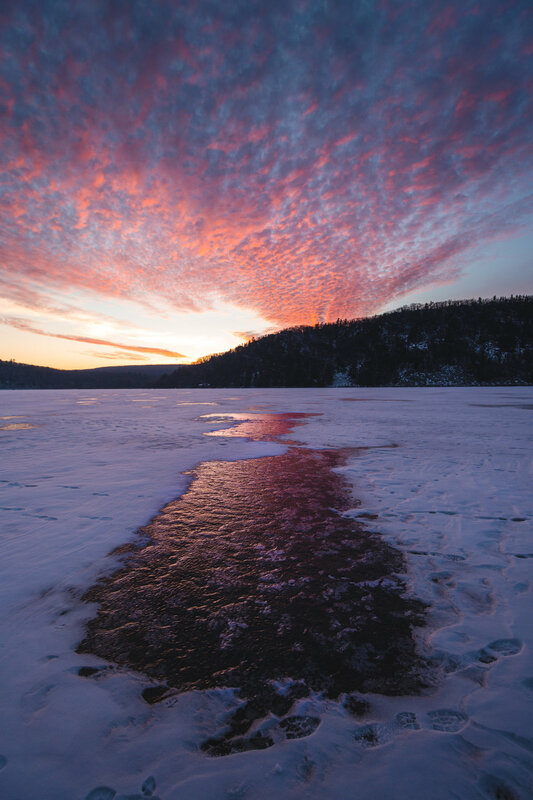 Get yourself a canoe, paddle board, boat, or if you’re lucky enough in the winter, walk across the lake as it freezes over! Thanks for reading! 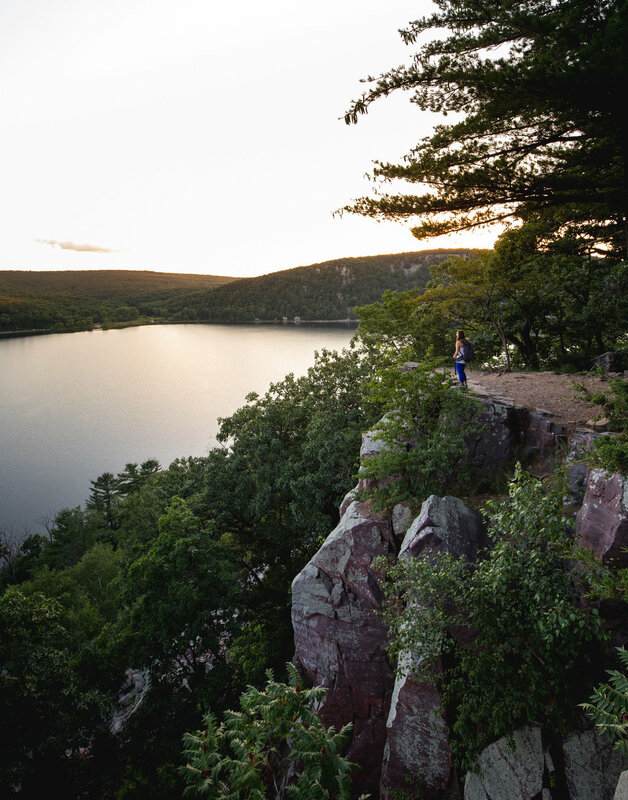 Please leave a comment with any tips you may have about hiking at this park!